Big thank you to everyone that shopped both the Scentsy and Thirty-One fundraisers. And a big thank you to our consultants that donated their commission for these fundraisers. Sara Puskar with Scentsy & Hollie Webb with Thirty-One. 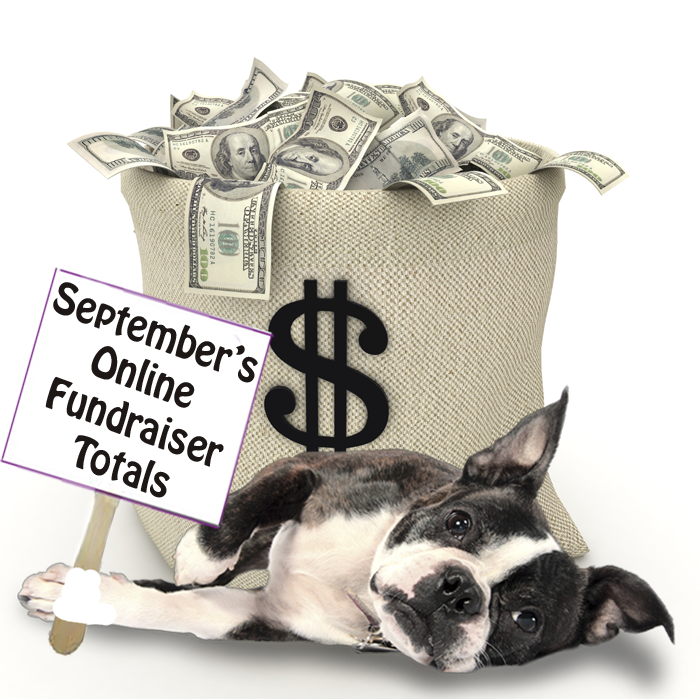 We have some really great fundraisers lined up in the coming months so lets keep things rolling!! 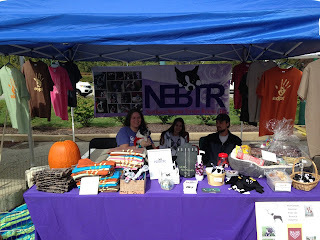 Thanks to everyone that helped out at DogtoberFEST - manning the booth, showcasing adoptables and making items to sell. 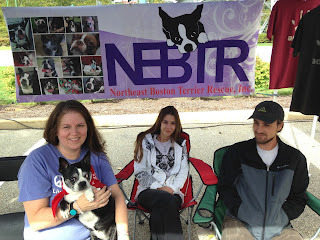 We had a few BT reunions and made $320 for NEBTR! 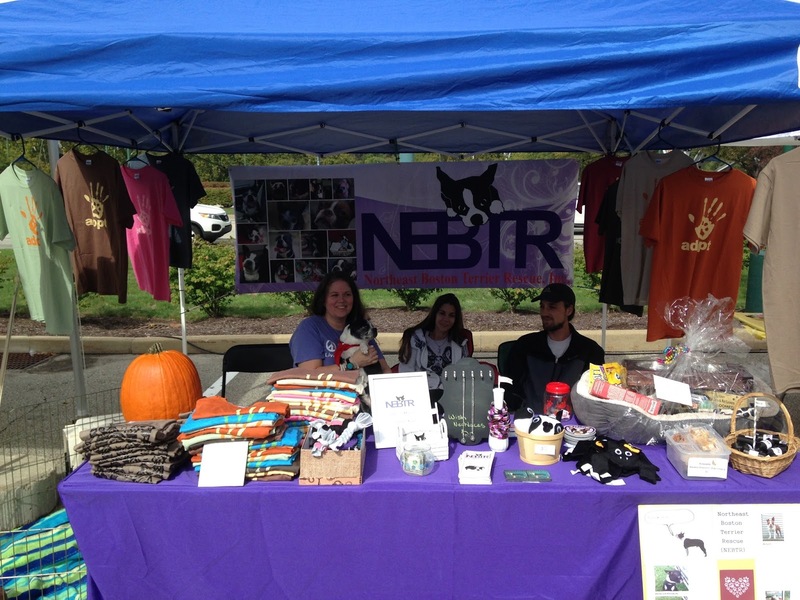 Many thanks to April and all those who helped out at this event. Great job! Unfortunately, we had to put Chibby down a few weeks ago. He had contracted Lyme's disease last year (and was treated accordingly), but this year, his poor kidneys failed him. It was a very emotional day for all of us. 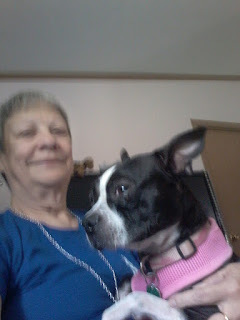 Chibby was rescued from the NYACC in 2012 by NEBTR. Tom and his family showed him the love that he had never received before. Our sympathy to him and his family, and thank you for loving our Chibby. I just had to share these pictures with the group. 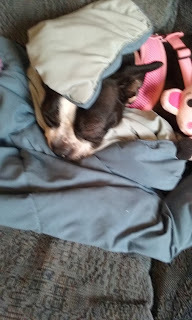 I discovered today that Sarah loves to burrow under a blanket. These pictures showed her failure to actually get under the blanket but got enough of it over her head and she went to sleep. 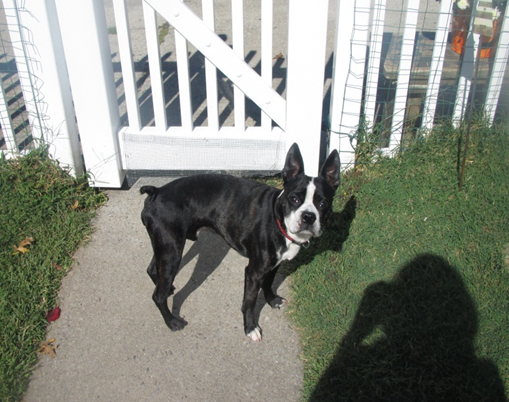 This is definitely a sweet little girl just in need of consistency, love and training. And this is how I found Sarah this morning all rolled up in the comforter on my guest room bed. She has claimed this room as her own. Living the comfy life as it should be! 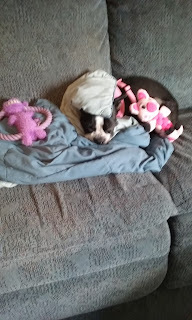 A big woof wooftastic thank you to Sara Puskar for the Nylabone Dura Chew Bacon Variety pack. As you can see from the picture, the edible bone did not last very long. The other 2 are safe in her room in her own personal toy box which is filling up daily. She loves her new gifts and I am getting an unexpected benefit in that she is really starting to trust me and comes up to me for attention on her own. Thank you Sara from both of us. Look who’s letting mommy hold her after only 6 days. She came over to me on her own and literally asked to be picked up and held. 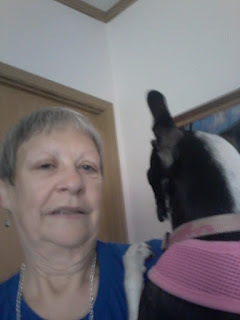 She is finally trusting me. I almost cried. I don’t usually like to include pictures of myself but in this case it was necessary. Please welcome Fred to the NEBTR family. Fred arrived last night nervous and malnourished. Fred is about 4 years old and not neutered. He is safe now. Happy Birthday to Panda, who got what she really wanted, a forever home with a GIANT yard and lots of love! Follow us on @Facebook ! !